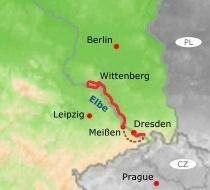 In brief: We start this journey in Wittenberg, only 1½ hrs south of Berlin. 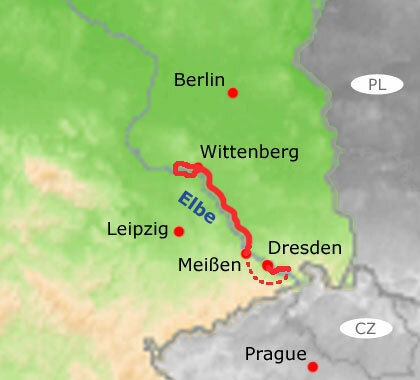 Sites intimately connected with European history await us along the route – such as the place where the Reformation emerged in 1517 and the bridge where U.S. and Soviet troops first met at the end of WWII. Furthermore, you will also discover the less famous but no less amusing stories and local chronicles along our way – giants, mermaids and knights in shining armour. The route itself follows the river on dedicated cycle paths and silent back roads, mostly through lush green, open countryside and sleepy little villages. Small ferries will take us across the river at several points. Palaces and castles pop up every now and then, inviting us to take a closer look. So if you like the sound of cycling surrounded by nature whilst exploring a wonderful part of Europe, then do come along and join us on this cycling holiday.